We've always been passionate about making quality piano lessons affordable and accessible to everyone, from kids to adults and beginners to advanced students — which is why we spent many years developing Musiah, the world’s first virtual piano teacher, so folks everywhere from New York to Sydney can enjoy learning piano up to 16 times faster than through traditional piano lessons — all in the comfort of your own home at the most convenient possible time for you. But what about the many people who would love to try piano lessons but don’t currently own a MIDI keyboard? While there are great guidelines on what to look for when choosing a MIDI keyboard HERE — understandably, some folks may feel unsure about investing in a MIDI piano keyboard before they have tried the Musiah piano lessons software. Well, now there is a perfect solution – the FREE Musiah Virtual Piano which is now included in the PC and Mac versions of Musiah at no extra charge. Put simply, this great Virtual Piano Keyboard enables you to play piano notes using your computer keyboard. Note: While you don't need a real MIDI keyboard to try our terrific piano lessons, we recommend using our built-in Virtual Piano Keyboard only as a temporary solution. Once you have tried a few lessons, if you decide that you would like to continue, we suggest buying a real MIDI keyboard as soon as possible for the optimal learning and playing experience. For advice on what to look for when choosing a real MIDI keyboard please see our MIDI Keyboard Info. Whether you're interested in our Virtual Piano Keyboard, our piano lessons or both — simply take our Online Piano Lessons 14 Day Free Trial to experience the joy of making piano music right now. To enable the Virtual Keyboard, place a check in the 'Enabled' check box. If you press some keys on your computer keyboard, you should hear the sound of the currently allocated Musiah virtual instrument coming from your computer speakers / headphones. To disable the Virtual Keyboard, simply uncheck the 'Enabled' check box. 1) The keyboard will only make sound if the green 'Active' light is showing. In certain situations where a keyboard response is not appropriate, the keyboard becomes inactive (in which case the 'Active' light turns off). For example, in some lesson modules the student is required to respond using the mouse / touchscreen. In this case, the Virtual Keyboard will become inactive until the next lesson module that requires a keyboard response. 2) You can close the Virtual Keyboard by clicking the 'X' and the Virtual Keyboard will still remain enabled. You just won't be able to see it until you once again click 'View', then 'Virtual Keyboard'. 3) The triangle makes the keyboard smaller / larger. 4) The keyboard is draggable. For example, you may wish to move it to the bottom right of the screen so it will be out of your way. 5) The Virtual Keyboard has two layouts. 'White Keys' is the default layout. It displays several octaves of white keys. The 'Black & White Keys' layout displays fewer octaves, but includes black keys. This layout is suitable for pieces that contain sharps and / or flats (these are typically more advanced pieces). 6) The range of piano keys can be customized for each row of characters on your computer keyboard. For example, clicking 'C' or '2' at the left side of the keyboard opens a list of letter-names and octaves that you can select. 7) Please be aware that the Virtual Piano Keyboard is not intended to be used on its own, i.e. outside the Musiah Piano Lessons Software. 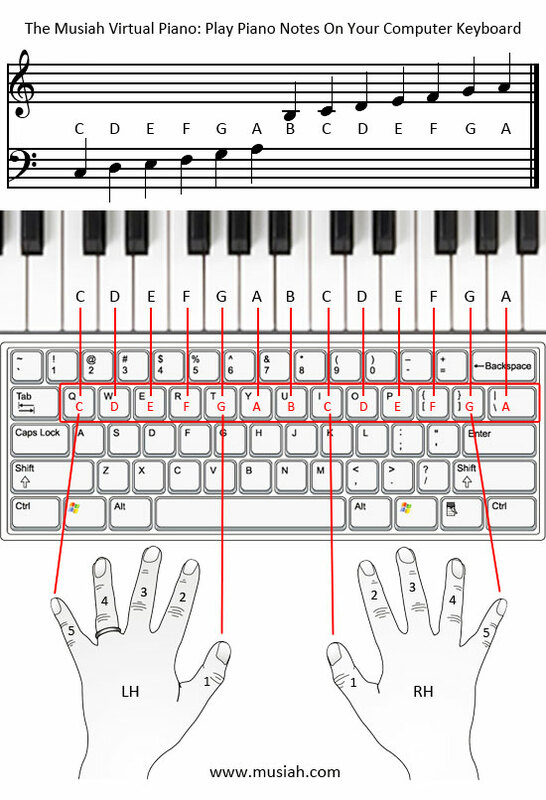 Placing your hands on your computer keyboard as shown in the above image will enable you to play many of the early pieces on the Musiah piano course without having to move your hands around. In Lesson 01 there is a question: “Play the C above middle C”. To do this, press the “A” key on your computer keyboard. Also in Lesson 01 there is a question: “Play all 5 C’s on your keyboard”. To do this, press the following keys (in order) on your computer keyboard: 1 Q I A Z. In Lesson 30, you will need to play the C above middle key. In this instance, I recommend using the “A” key on your computer keyboard. What if I'm not a Musiah piano student? If you take our Online Piano Lessons 14 Day Free Trial, you will have access to both our lessons and the Musiah Virtual PIano Keyboard for the duration of the free trial. This way you can have fun trying out the Virtual Piano Keybaord — AND you can also try out Musiah's fantastic piano lessons as well — completely FREE for 14 Days. There is absolutely no risk, no cost and no obligation to continue lessons beyond the 14 day trial, so go on... what are you waiting for?